The Substance Abuse Treatment and Public Safety brief found that the sooner substance abuse is treated, the bigger the long-term cost savings and increases in public safety. At a time when some have raised concerns about the release of people convicted of drug offenses from federal prison due to U.S. Sentencing Commission reforms, the research shows that substance abuse treatment helps individuals transition successfully from the criminal justice system to the community. The policy brief -- the last in a series that examines the impact of positive social investments on public safety -- found that: Increases in admissions to substance abuse treatment are associated with reductions in crime rates. Admissions to drug treatment increased 37.4 percent and federal spending on drug treatment increased 14.6 percent from 1995 to 2005. During the same period, violent crime fell 31.5 percent. In California, where Proposition 36 diverted thousands of people from prison and jail to treatment, violent crime fell at a rate that exceeded the national average. 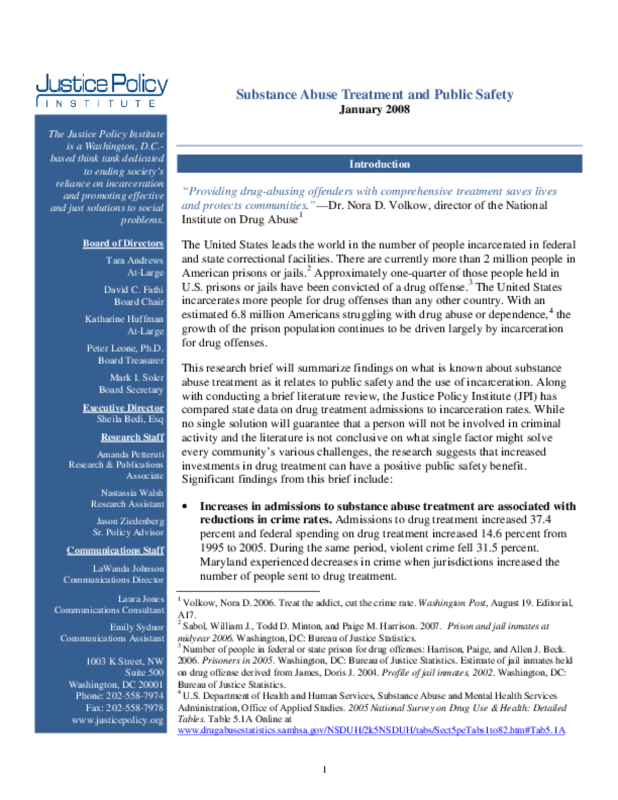 Increased admissions to drug treatment are associated with reduced incarceration rates. States with a higher drug treatment admission rate than the national average send, on average, 100 fewer people to prison per 100,000 in the population than states that have lower than average drug treatment admissions. California, in particular, experienced decreases in incarceration rates when jurisdictions increased the number of people sent to drug treatment. Substance abuse treatment prior to contact with the justice system yields public safety benefits early on. Research has shown that drug treatment programs improve life outcomes for individuals and decreases the likelihood that a drug-involved person will be involved in the criminal justice system. Substance abuse treatment helps individuals transition successfully from the criminal justice system to the community. Community-based drug treatment programs reduce the chance that a person will become involved in the criminal justice system after release from prison. Substance abuse treatment is more cost-effective than prison or other punitive measures. The Washington State Institute for Public Policy (WSIPP) found that community-based drug treatment is extremely beneficial in terms of cost, especially compared to prison. Every dollar spent on drug treatment in the community is estimated to return $18.52 in benefits to society in terms of reduced incarceration rates and associated crime costs to taxpayers. Copyright 2008 Justice Policy Institute. All rights reserved.